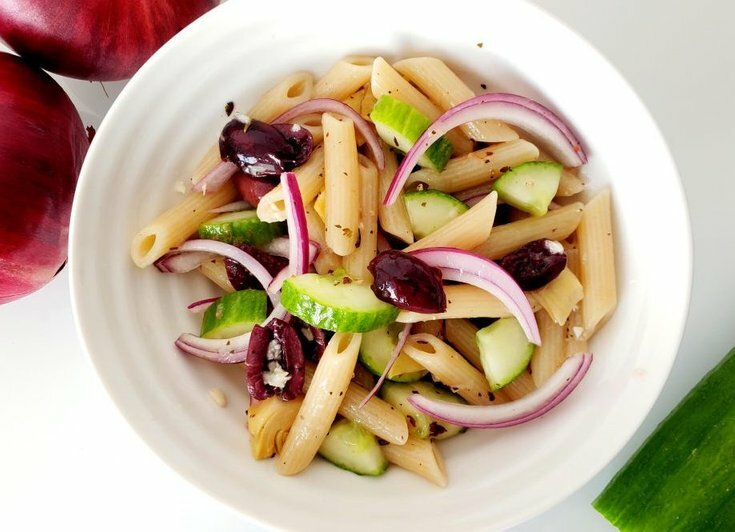 One thing to note, Mediterranean cuisine refers to the food and methods of preparation by the people of the Mediterranean Region, but it's one and the same. The countries and islands within this region are Spain, France, Monaco, Italy, Slovenia, Croatia, Bosnia and Herzegovina, Montenegro, Albania, Greece, Turkey, Syria, Lebanon, Israel, Egypt, Libya, Tunisia, Algeria, and Morocco. Oh, and did I mention that this is a minimal effort recipe, as the only thing you will need to cook is the pasta. Start by cooking the pasta according to the package. So bring your water and noodles to a boil and cook until al dente, about 8-12 minutes. You can really use any shape of pasta, I personally like the penne rigate, but the bow ties or other kinds will work just as good. Then, set everything aside for now. Now, the pasta should be cooked, so just rinse it under cold water to prevent it from sticking. Then, stir in the cut-up vegetables. By this point, it should begin to look like that loaded greek pasta salad I promised you. Finally, mix in the greek dressing and add salt and pepper to taste. 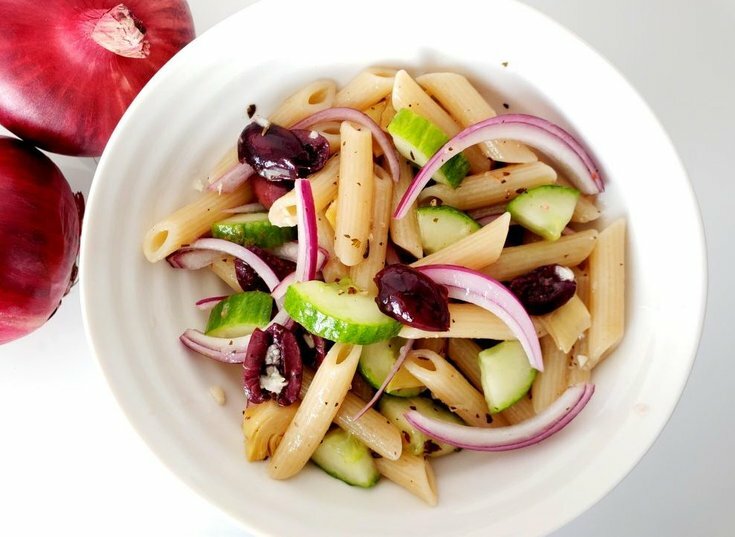 Also, I like to leave my Greek pasta salad to marinate for about 20-30 minutes, just to allow the onions and garlic to seep through everything. 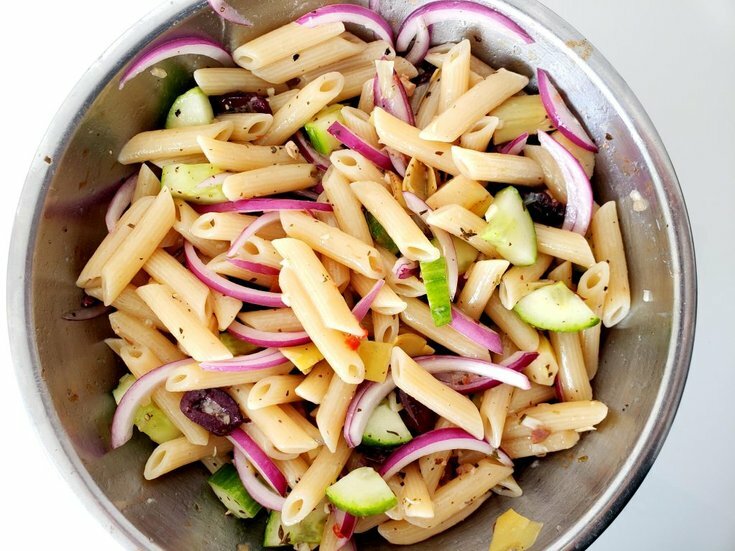 Although, the pasta salad can be eaten right away, and don't worry it will still taste great. Cook the pasta according to the packaging, about 8-12 minutes. 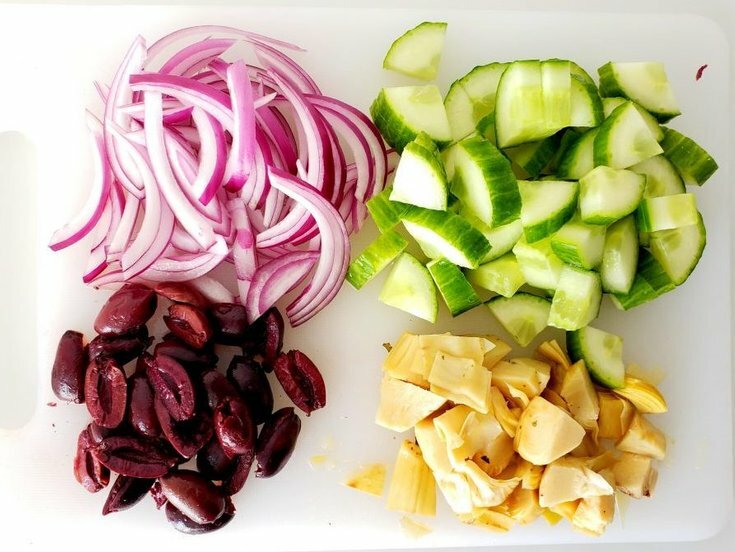 Next, cut the cucumber into slices, then into quarters; mince the garlic; pit and halve the kalamata olives; roughly chop the marinated artichoke hearts;and slice the red onion into half moons. Set aside. Rinse the cooked pasta under cold water to prevent the noodles from sticking. Then, add pasta to a large mixting bowl. Finally, add the chopped veggies, the greek dressing, salt, pepper.